Mr. Tolson is knocking at the door on the door of Dr. Roberts the in-house psychologist. Mr. Tolson: Are you Dr. Roberts? Dr. Roberts: Yes, come in. Please have a seat. Sorry to have to call you down here on such short notice, but your company asked me to give you a creativity test. Dr. Roberts: Well, they’re pretty easy. Actually, they can be fun. Would you like a beverage? Mr. Tolson: I work in the computer center on the 17th floor. We just got a new computer in and they put it in the back of the center. And all I did, I told them that they should put it up in the front of the center, so more of the people could get to it, but they didn’t. Dr. Roberts: Fascinating. Okay, the first test that we’re going to do is called a word association test. Mr. Tolson: I don’t know what that is. Dr. Roberts: Well, it’s pretty simple. I’ll give you a word and you say just whatever you can think of. Mr. Tolson: Well, that sounds easy. Dr. Roberts: Great! Okay, well let’s start. First word, "shoe". Dr. Roberts: Okay, you’re just saying the words that I’m saying. Mr. Tolson: I know, but when you say the word, that’s the word that I think of. Dr. Roberts: Okay, it’s my fault then. Let’s try again, only this time I want you to change the word. Mr. Tolson: Okay, so not just the same word. Dr. Roberts: Great. You’re catching on. Okay? Next word "hat"
Dr. Roberts: Okay, now all you are doing is just pluralizing the words that I’m saying. Mr. Tolson: Yeah, but they’re different. Dr. Roberts: Yeah, they are different, but that’s not what I want. Okay, let me give you an example. Why don’t you give me a word. Dr. Roberts: Yeah, any word. Dr. Roberts: Fine, Uh, that makes me think of "constriction" (folds arms across chest in a constrictive manner). Don’t worry you’ll catch on. Let’s try it again. Okay, "trumpet"
Dr. Roberts: All right, now you’re just using the words that I’ve already used. Mr. Tolson: Well, you didn’t say that I could use them up. Dr. Roberts: Well, you can. Okay? Why don’t we just move on to another test. Mr. Tolson: They got this new computer up in the computer center and I just told them they should put it up front, but they put it in the back. Dr. Roberts: That’s fascinating. Okay? Look, uh, for this next test I’m going to start a sentence and I want you to complete it, okay? Mr. Tolson: So all I have to do is finish it. Okay, all right. Well this one sounds easy. Mr. Tolson: His friend Jerry...who also had a red balloon...and liked to add words. Dr. Roberts: Look Mr. Tolson, I need you to come up with some answers on your own. Okay? Dr. Roberts: Look, I heard you the first time. Mr. Tolson: Are you angry at me? Dr. Roberts: No, Mr. Tolson, I’m not angry at you. Let’s move to the next test all right. This is called a Rohrshach Test. What it is, is some people took a piece of paper and put some ink on it and folded it. What I need you to do is look into these ink-blots and tell me what you see. 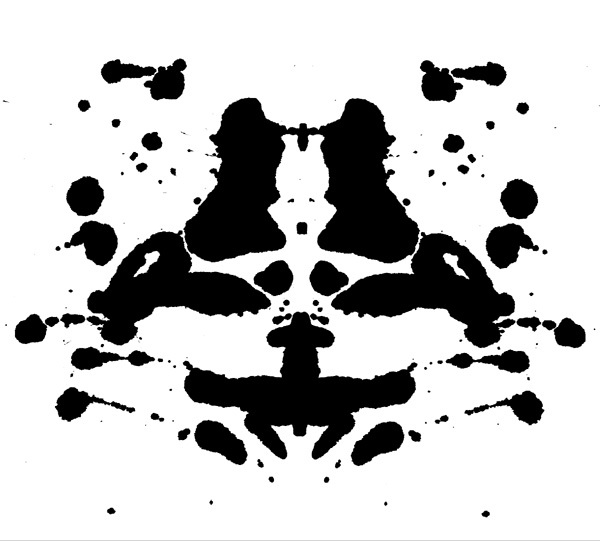 (Holding up ink blot) Now, what do you see here Mr. Tolson? Mr. Tolson: A black smear. Dr. Roberts: Yeah, that’s exactly what it is. I need you to look into it and tell me what you see. Mr. Tolson: (Looking at the Dr.’s shoes) I see black shoes. Dr. Roberts: That’s good, I could see that. Mr. Tolson: (looking at the Dr.’s tie.) I see a brown tie. Dr. Roberts: Um hum, good, good. Mr. Tolson: (Looking at the wall) I see a diploma from . Dr. Roberts: That is enough Mr. Tolson, you will not leave this office until you tell me what you see in this. Mr. Tolson: I don’t want to, I don’t want to. Dr. Roberts: Look, I’m going to make you use one creative bone in your body if it’s the last thing I do. Now look at this and tell me what you see. Tell me. Dr. Roberts: Good, go with that. Mr. Tolson: And the dog is a terrier...and it’s rabid... and it shakes its head back and forth in meaningless anger. Dr. Roberts: Good, good, good. Mr. Tolson: And foam sprays from its mouth and we follow this droplet of spit down to see where it lands on a symmetrical lawn and the drop of spit slowly transforms becoming a flaming brass eagle holding the Magna Carta in its claws. This eagle takes flight and soars over the (spit) gray convulsive Atlantic Ocean. (lowering voice) It flies low by the choppy waves a massive shimmering sea bass leaps up and it snatches the Magna Carta. But the sea bass is served to the family of Long John Silver’s restaurant. And as the family devours the fish the father is transformed. His eyes glow wolf-yellow, he starts at his claws and a massive crowd gathers around and he screams wildly into the night sky. "Where is the passion?" "Where...is...the...passion?" Dr. Roberts: (stunned) I’ll see what I can do about getting those computers moved. Mr. Tolson: Yeah, on the 17yh floor and they put it in the back.